What is the Marugoto Japanese Online Course? The Marugoto Japanese Online Course is a course for learning Japanese language skills comprehensively, and offered in the Japanese learning platform, JF Japanese e-Learning Minato, operated by the Japan Foundation. Marugoto refers to the coursebook, Marugoto: Japanese Language and Culture, developed by the Japan Foundation and based on the JF Standard for Japanese-Language Education. 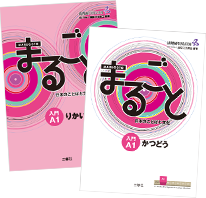 This coursebook is designed with an emphasis on using Japanese to communicate, and on understanding and respecting other cultures. The Marugoto Japanese Online Course is the online course version of Marugoto: Japanese Language and Culture. Please visit here to know more about the coursebook. What is the JF Standard for Japanese-Language Education? The JF Standard for Japanese-Language Education is a tool for considering how to teach and study the Japanese language, and how to assess learning achievements. It was created based on the CEFR (Common European Framework of Reference for Languages: Learning, Teaching, Assessment), which is the basis for language education in Europe. Using the JF Standard for Japanese-Language Education, you will be able to know your proficiency level in Japanese by what and how much you can do. Please visit here to know more about the JF Standard for Japanese-Language Education. This course is mainly for adult learners of Japanese overseas. Being an online course, it is best suited for people who are interested in the Japanese language but could not easily find the time to study because they are busy with work, school, household duties, childcare and others, or who does not have a place to study Japanese near them. The Marugoto Japanese Online Course is available not only for PCs but also for tablets and smartphones. You can use your spare time to study Japanese anytime and anywhere by using a tablet or smartphone. What levels does the course have? The Japanese language levels of the Marugoto Japanese Online Course conform to the levels in the JF Standard for Japanese-Language Education. The courses for A1 and A2 levels are currently open. What languages are available for the course explanations? The Marugoto Japanese Online Course currently has the following languages for explanations. We plan to expand the course into multiple languages in the future to make it possible to read the explanations in more languages (launching date undetermined). try taking the Japanese Test for Course Recommendation! What course types are there in the Marugoto Japanese Online Course? There are two course types in the Marugoto Japanese Online Course. This is a self-study course using interactive study content. The support of a supervising tutor is added to self-study using interactive study content.Support includes correction of assignments and live lessons for each topic, among others. The Tutor Support Course is conducted in groups so that you can also meet friends who are studying Japanese. What is the difference between the "Katsudoo Course" and the "Katsudoo and Rikai Course" in level A1? Level A1's Katsudoo Course is a course intended for people who want to study Japanese casually.Using the Katsudoo study content, you can aim to acquire practical communication skills in everyday situations by listening to Japanese and practicing speaking in Japanese a lot. On the other hand, the Katsudoo and Rikai Course is a course intended for people who want to study Japanese fully.Together with Katsudoo, you can systematically learn how Japanese is used within the communication in Rikai.You can aim to acquire comprehensive Japanese language skills in reading, listening, writing and speaking. Please visit here for details on Katsudoo and Rikai. How do you go about studying in the Katsudoo and Rikai Course? The Katsudoo and Rikai are both written with the same topics. A topic is composed of two lessons, and each lesson is studied in order from Katsudoo > Rikai. list of courses offered at JF Japanese e-Learning Minato! the Marugoto Japanese Online Course. What kind of study materials will I study? In the Marugoto Japanese Online Course, there are two study contents, Katsudoo and Rikai, to help you learn to communicate using the Japanese language. In Katsudoo, you will study from steps 1 to 6 for each goal to acquire practical communication skills in everyday situations. Check the goal and situation. Listen to the sound and practice saying it. Listen to a conversation, etc., and understand its contents and take note of the expressions. Watch a video, and practice speaking or writing in Japanese. Check by yourself if you were able to reach the goal. Understand Japanese life and culture by looking at photos and watching videos. 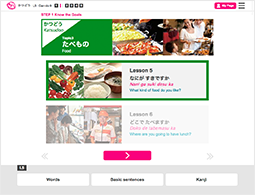 In Rikai, you will study from steps 1 to 8 for each lesson to learn about the structure of Japanese. Check what you will study. Practice Japanese script and vocabulary. Learn the kanji for words related to the topic. Understand sentence structure and rules by relating the conversation and grammar. Check by yourself if you understand how to use Japanese appropriate for this situation. There are a variety of contents available to support everyone's studies, so that you can properly understand and advance even with self-study. You can refer anytime to the contents to be studied in this course, as well as the basic knowledge related to Japanese, grammar materials, word books, kanji lists, etc. These study materials can also be downloaded in PDF. Besides the content of the lesson being studied, you can refer anytime to the meaning and explanation of words, basic sentences and kanji to be studied in the lesson, so that you can immediately look up anything you do not understand. There are supplementary explanations for new words and expressions, information on Japanese culture, etc., depending on the content of the practice under study. In the online course, you can study at your own pace and in your preferred time and place. We have provided each person with a My Page so that everyone can look back on their learning process by themselves, and help them continue with their Japanese language studies, which they have started and given considerable effort to because of their interest. 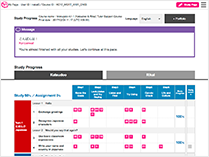 Since the progress of your study is recorded, you can check the places you have studied at a glance, and advance at your own pace while checking your daily study progress. Since your Japanese language and culture studies are recorded, including self-evaluations and written exercises during the study, you can look back on your studies anytime and see your learning process and accomplishments over the course. please try our trial version! copyright(c) The Japan Foundation. All Rights Reserved.